The sharp fall of gold price during the year has taken its toll on gold producers such as Barrick Gold (NYSE: ABX). Moreover, the decline of precious metals prices has also adversely affected companies such as Silver Wheaton (NYSE: SLW) and Royal Gold (NASDAQ: RGLD). Nonetheless, these companies are still a solid investment for those who still seek to invest in precious metals. Let’s see why. The following example demonstrates the lower risk Silver Wheaton and Royal Gold have compared to the risk gold producers take. Barrick has recently announced it will suspend construction activities at the Pascua-Lama mine except those required for environmental protection and regulatory compliance. This change will reduce the company’s annual capital cost by $1 billion. This project, however, also involves Royal Gold , which has between 0.78% and 5.23% sliding scale net smelter royalty in this mine, and Silver Wheaton , which has a silver streaming agreement with Barrick. Barrick’s decision will push back the completion date by one year to the end of 2016. This decision is partly due to higher operation costs, economic conditions and much lower gold and silver prices. This is just an example for the high risk precious metals producers take. Nonetheless, this isn’t the case for Royal Gold and Silver Wheaton. Both companies are covered and won’t be adversely affected by this development. Silver Wheaton amended its contract with Barrick to receive silver from Barrick’s other mines, and Royal Gold isn’t responsible for capital costs of the project and will continue to receive royalty payments from Barrick. This example shows how both Royal Gold and Silver Wheaton are less risky than gold producers. But less risky doesn’t necessarily mean a good investment. Therefore let’s consider additional advantages Silver Wheaton and Royal Gold have as investments – high profitability and potential growth in sales. The sharp drop in the prices of gold and silver has reduced the profit margins of Silver Wheaton and Royal Gold in the past several quarters. Nonetheless, these companies’ profit margins are still very high and are well above other gold producers’ profit margins. 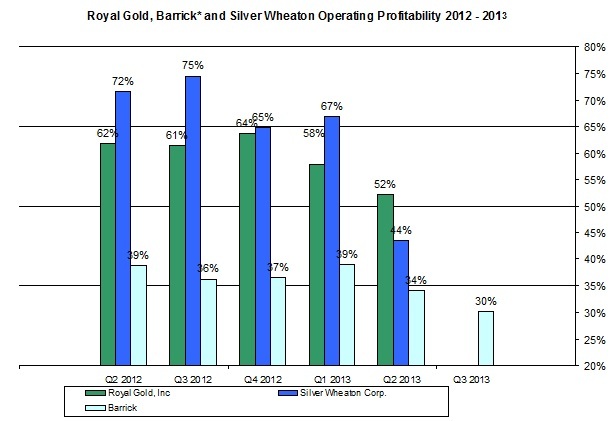 As you can see in the chart above, the profit margin of Silver Wheaton, Royal Gold and Barrick (the company’s operating profit was controlled for its impairment and goodwill provisions) have declined to their lowest level in recent years. 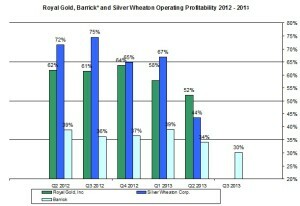 Nonetheless, Silver Wheaton and Royal Gold’s profit margin are still very high for the industry. Royal Gold’s profit margin is mostly related to the royalty contracts it has with gold miners and the price of gold. In the coming months, Silver Wheaton’s profit margin may further slide due to higher gold production: Silver Wheaton’s gold operations have a lower profit margin than silver’s. The table below shows the changes in the prices and costs of gold and silver and profit margins in the first half of 2013 and 2012. Silver Wheaton purchased earlier this year Sudbury and Salobo mines, which will increase the company’s gold sales. Moreover, the production of 777 mine is also expected to rise. This means, even though the company’s operating profit may slightly decline, its sales are likely to rise in the coming quarters on account of higher gold sales. Royal Gold didn’t increase its sales in the past quarters but looking forward, the company’s recent acquisition of El Morro copper-gold project along with the preliminary production of the Mt.Milligan gold and copper mine are likely to augment the company’s revenues in the near future. Thus, the higher precious metals sales are likely to offset some of the adverse effect of the drop in gold prices. The relatively high profit margins also reflect in these companies’ dividend yields. The drop in gold prices is likely to cut down the dividend payments of gold companies, but the high profit margins of Silver Wheaton and Royal Gold are likely to keep their dividend. Their current dividend is also very reasonable at 1.79% for Silver Wheaton and 1.64% for Royal Gold. This is another advantage these companies’ stocks have over holding precious metals ETF such as SPDR Gold or Shares Silver Trust that offer no dividend payment. Investors who still seek to invest in precious metals, Silver Wheaton and Royal Gold offer two interesting investments: They are less risky, have high profit margins, are likely to increase their sales on account of new projects, and offer reasonable dividend payment.